This is a scene that many people wished did not take place. 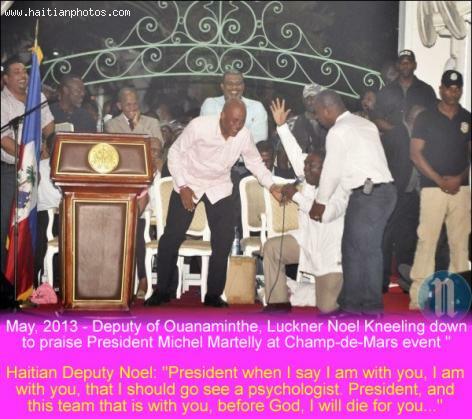 During an event organized by the Martelly's government to commemorate his two years in office, the Deputy of Ouanaminth, Luckner Noel, went overboard in expressing his gratitude for the Government of Michel Martelly. Deputy Luckner Noel went on his knee before President Michel Martelly to thank him for the many projects that have been completed in Ouanaminthe for the past two years. Several members of the Parliament were present to show their support to the government. Majority bloc or Parliamentarians for Stability and Progress (PSP). In an action that was criticized by many people, The Deputy of Ouanaminthe, Luckner Noel went on his knee before President Michel Martelly to show his level of satisfaction with the current government. Deputy Luckner Noel was elected to his post under the political party Alternative which is openly in opposition with the government of Martelly. This action by the Deputy of Ouanaminthe will not be helpful to him vis-a-vis his party. Do you think he went too far in demostrrating his appreciation for the president? Do you have a better name for this act? Is it an act of gratitude or just flattery by the Deputy? Do you think this will look bad on the people of Ouanaminthe? Do you think this will diminish the role of the House of Haitian Parliament? I do not condone his gesture. We do not know how worse Ouanaminthe has been since the departure of Baby Doc. This poor country has been sinking deeper and deeper in such a filth that even those with strong will are seen running away in despair. If this politician feels that it is his genuine way to express his gratitude, so be it. What the rest of us need to do is to respect his gesture and sympathize with his action. Stop criticizing, we all know us Haitians excel at criticizing others. WHAT A SHAME .IF I WERE FROM OUANAMINTHE I WOULD VERY VERY EMBARRASSED.DOES HE REALLY KNOW HI ROLE AS CONGRESSMAN.